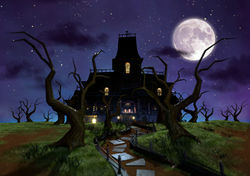 Gloomy Manor is the first mansion Luigi visits in the game Luigi's Mansion: Dark Moon. This mansion is similar to Luigi's Mansion from the first game, and is a standard, run-of-the-mill haunted mansion, in the middle of a storm. It is here that Luigi acquires the Poltergust 5000, the Strobulb, the Dark-Light Device, and the second Dark Moon piece. The sub-boss is the Poltergeist, and the main boss is a giant, purple spider that has been possessed by the Grouchy Possessor, which is located in the Cellar. It has 3 floors and a basement, and features 5 standard missions, a boss mission and a bonus mission which is unlocked after collecting all the Boos in the manor. Not much is known about the Gloomy Manor besides that it is abandoned. E. Gadd was using this mansion to observe the Ghosts before the Dark Moon shattered. During the time E. Gadd spent studying the ghosts he made modifications to the mansion running pipes and wires throughout the mansion. A statue of Professor E. Gadd can be found in the Patio, suggesting that E. Gadd owned the mansion at some point. The music played before the elevator breaks down is the Pause Menu music from Mario Strikers Charged. I, Professor Elvin Gadd, had been observing the ghosts living in this Gloomy Manor, when suddenly the Dark Moon broke into pieces and the ghosts got all hostile-like! A-1 Poltergust 5000 If we're to restore the Dark Moon, we'll need to get you properly equipped. I've got just the device for the job, but I left it in the Gloomy Manor! Mind fetching it for me, sonny? A-2 Gear Up Now that you're properly equipped, let's find those Dark Moon pieces! Paranormal readings are stronger in the north rooms of the Gloomy Manor, so we should start out search there. Quiet, Please! According to the Parascope, the ghostly activity in the north section of the Gloomy Manor is increasing! Now that you've recovered the gears, we should be able to investigate. A-4 Visual Tricks Criminy! Someone's been casting illusions in the Gloomy Manor! We'll need my Dark-Light Device to see through this hooey. I'm pretty sure I left it in the Lab. A-5 Sticky Situation Clean up those darn spiderwebs! They're blocking our progress AND they ruin the furniture AND they're just plain gross! 💀 Confront the Source This paranormal reading is off the charts! I don't know what's down in that Cellar, but it's not happy. Why don't you...uh...investigate? 👻 Gradual Infiltration We have an...interesting situation. The Parascope is picking up mild paranormal signals in the manor. I'm sending you in to investigate. Gloomy Manor Music - The song that plays in Gloomy Manor. Gradual Infiltration Music - The song that plays during Gradual Infiltration. In Mini Mario & Friends: amiibo Challenge, Gloomy Manor, as well as its surroundings, form the setting of Mini Luigi's stages, contained in a world called Moonlight Mansion. The dilapidated fish fountain at the left of the front yard, along with the polygonal alley, sharp bar fences, and light poles with rough spiraled designs, retrieve their decorative roles around Gloomy Manor. This mansion's music played as the background music for the Nintendo 3DS's eShop during Halloween 2014 in North America. This page was last edited on September 23, 2018, at 13:13.